The dusty border town of Sonauli has a bad reputation, like so many border towns. But even with its dust, touts, and opportunists, the frontier didn't strike me as out of the ordinary, and seemed less corrupt than many. At least no one in an official capacity encouraged me to hand over a tip. I walked across the border from Nepal, wandered down the filthy street—stepping around mud—to Immigration, which was located in what looked to me like a tiny shack. I was pestered by a rickshaw driver as I filled out a paper and got my expensive India visa stamped, then walked about 20 feet before a share-taxi driver asked me if I was looking for a lift to Gorakhpur. I was. And he only needed three more passengers to fill his 4WD so we didn't have to wait that long. Including the driver, there were four of us in the front seat. Goodness—they do stuff you in here. The man next to me rolled his eyes when he saw the fourth passenger pile into the front, somehow fitting into the nonexistent space between him and the driver's seat, but unless one of us was prepared to buy the other seat, there was nothing to be done about the tight fit. 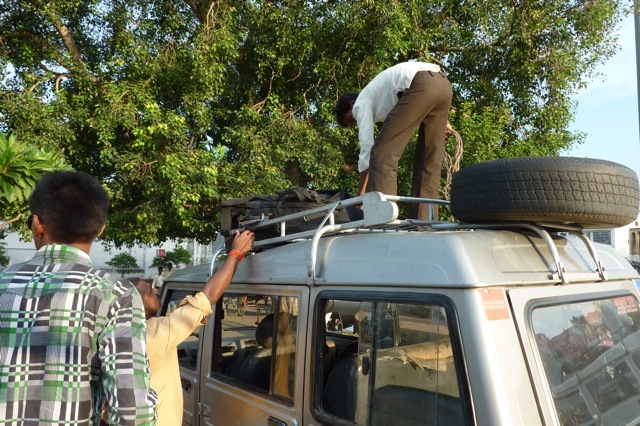 The driver stuffed himself in and started up, driving us down the potholed, cracked road, out of town and into the countryside of Northern India, honking at dogs, people, chickens, and motorbikes as he went. I didn't eat again...I am too worried about eating something that doesn't agree with me when I have hours to go in a car or bus. 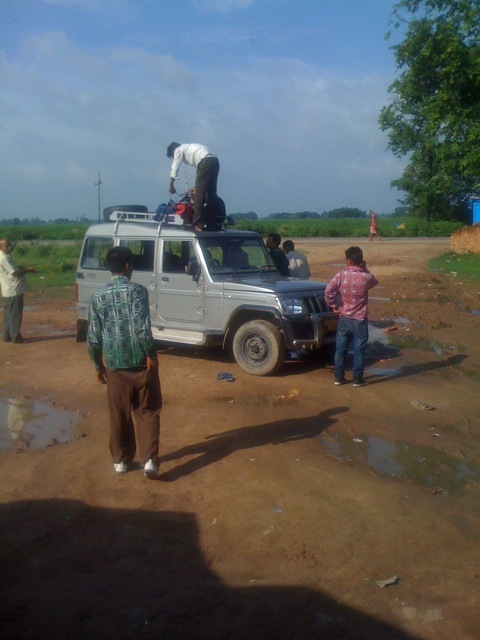 After three hours of mostly slow driving along the cracked roads, we reached the sprawling, chaotic city of Gorakhpur. This was just a way-station—I wasn't hanging around. But my train didn't leave until late—10:30 p.m. I had five hours to waste. The share-taxi finished its run—conveniently—outside the old British-style whitewashed railway station. I headed inside the dark interior, searching for luggage storage. This turned out to be at the far end of the station, and it turned out to be complicated. For reasons I didn't understand—it may have been shift-change time—I had to wait for 20 minutes for the man who recorded my details. The backpack does. The woven plastic bag I was dragging around souvenirs in until I got to the Varanasi post office did not. There were some promising open-air restaurants across the street. One thali looked as good as another. I walked along, trying to guess which food stand was cleanest, then I ran across an extraordinary room of headless sculptures. "Gods," he said, shrugging. Why doesn't the tourist see that they are gods? Of course, I could see that they were gods. This must be a place that makes god sculptures for temples and events. But the gods had no heads! Perhaps the heads are made separately, or by a head expert. 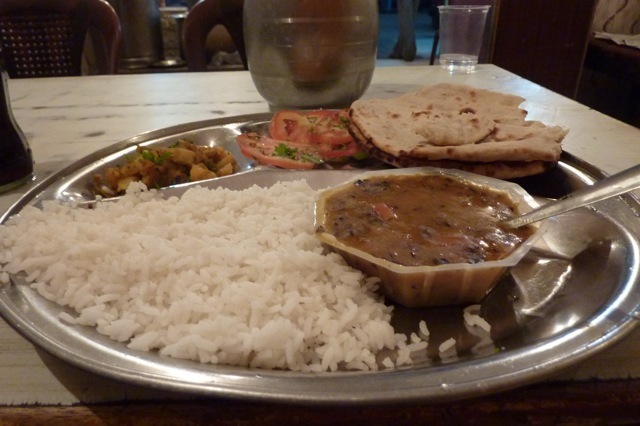 I sat down and had my thali—which of course was too spicy for me. This hadn't changed in the intervening years since I'd last been to India. I can't handle Indian food made for Indians, only Indian food made for Europeans. But I ate the rice and drank the funny fake Coke. 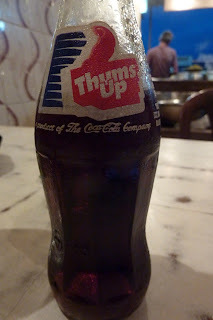 The fake Coke in India is, funnily enough, owned by Coca-Cola, who bought their successful competitor some years back. I wandered back to the train station and located an air-conditioned lounge intended for first-class passengers. Boy howdy. Now I was a happy train-rider. I went in, found a seat near not too many mice, and noticed the A/C lounge had its own toilets, which were significantly cleaner than the public ones. Hundreds of people descended on the train, pushing, shoving, desperate to get on to the cars without assigned seats. I held out my printed (confirmed) ticket—which I'd gotten from Cleartrip.com and printed out—and started asking people. They pointed me on to the first class sleepers. I was in AC2, which isn't AC1, but is sort of a slightly lower first-class, without doors on the shared compartments. I had a lower bunk in an open compartment with four beds. The other travelers were polite but kept to themselves. The attendant gave me a pillow and two sheets, then I didn't see him again. 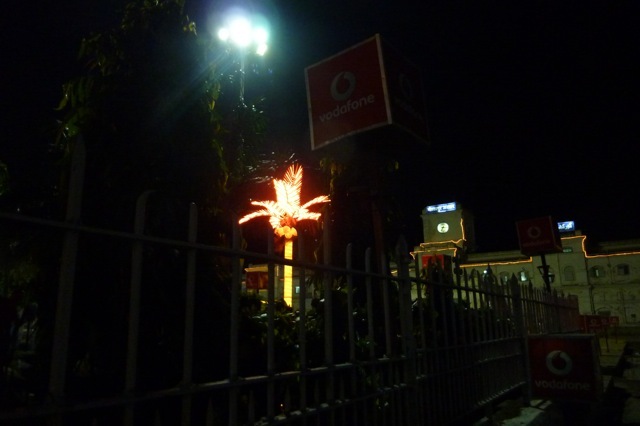 If the other passengers hadn't been disembarking when we reached Varanasi, I might have missed my stop in the wee hours of the morning. He led me through the dark station in the early morning, clinging to a thin path through the hundreds of people asleep on the platform. Did they sleep here every night? Were these pilgrims, waiting for their morning trains home? Oops, don't step on her. 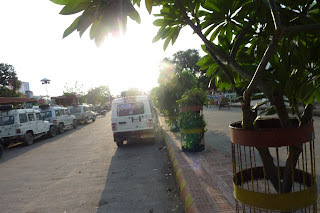 Outside, we got into the auto-rickshaw—this is a tuk-tuk in Thailand—and started up. Yes, I'd chucked out my budget-traveler cred and booked the Radisson for two nights in Varanasi. 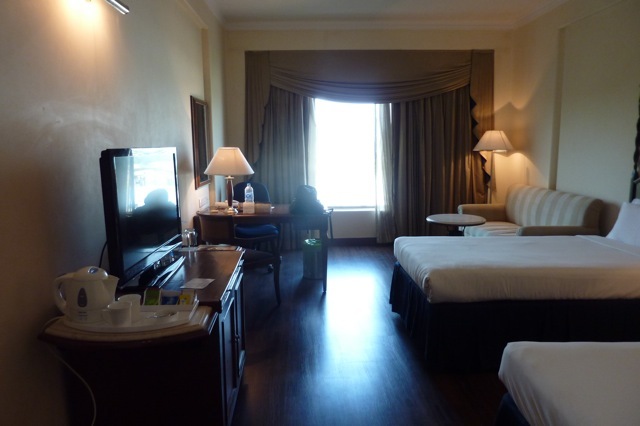 I was looking forward to the free wifi, the free breakfast buffet, and mostly, the outrageously comfortable room. And I was getting the most of it, arriving at the crack of dawn on check-in day and leaving at night the day I was checking out. "Hi, I'm kind of...early." My phone showed that I was trying to check in a five in the morning. The staff apologized that the hotel had a full house and didn't have a room ready yet, but several people were leaving for the airport and a room would be ready in a few hours. Yum. And then I hung out in the bar until my room was ready. I carried my damp backpack up to my room in the early morning sunlight. P.U. All of my possessions had been soaked on the roof of the bus yesterday afternoon and had been sitting in enclosed dampness since then.